Harder Electrical & Mechanical Services, Inc. Founded in 2003, Harder Electrical & Mechanical Services provides residential and commercial heating, cooling and electrical services. We have proudly been servicing the Albuquerque, Tijeras, Edgewood, and Moriarty areas for over 15 years. Locally owned and operated, Harder Electrical & Mechanical Services is open five days a week and on call on Saturday. Harder Electrical & Mechanical was founded with the philosophy of providing quality services for a fair price. With extensive training in electrical, mechanical, and refrigeration, Harder Electrical & Mechanical not only stands behind the work we do - we guarantee it. Our experienced technicians provide residential or commercial heating, cooling, and air conditioning services, repair/replace/install of all brands of equipment, and a 1-year warranty on labor along with any manufacturer's warranty on your products. Harder Electrical & Mechanical is your one-stop shop for all your electrical, heating, and cooling needs. Call us today at 505-281-4807 for a free estimate. Since 1992, Dave Harder has built an extensive skillset in heating, cooling and electrical services. After graduating from a 2 year tech. school, Dave received his training from large plumbing, heating and air, electrical and refrigeration companies in Albuquerque. 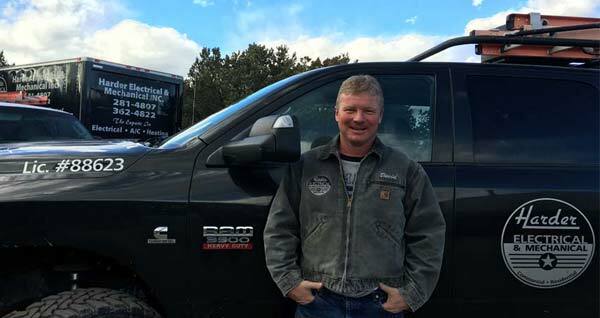 Ten years later, Dave started his own business, Harder Electrical & Mechanical Services, Inc. Since 2003, Harder Electrical & Mechanical has provided quality services to the community at a fair price. For large company experience at a small company price, choose Dave Harder. Harder Electrical & Mechanical is a member of the Better Business Bureau (Certified A+) and listed on Angie’s List with Superior Service Awards in electrical and HVAC services. Angie’s list presents this award to companies that have maintained a superior rating. In addition to our industry acknowledgements, Harder Electrical & Mechanical offers a 1-year warranty on labor and we honor manufacturer’s warranties. We are fully licensed in New Mexico, bonded and insured for your protection.